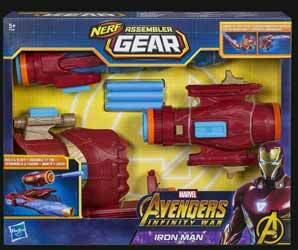 Hasbro release a range of Nerf guns and accessories with a Marvel Avengers: Infinity War theme. Now fans of the movie can role play as their favourite superhero character. The sets come in Iron Man, Captain America or Hulk designs. I don't know if that's all that's available in the UK at present, but this was all the press information we received indicated was available. However, the back of the box also shows that you can get your hands on a Spider-Man and Star-Lord set too. We were sent the Iron Man set to review and it's pretty obvious, from the very start, that these are highly detailed and constructed of solid, hard wearing plastic. The kit comes with three components that can be put together any way you see fit. 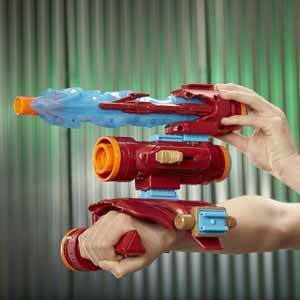 In fact, if you own more than one kit you can bolt everything together to create a giant super weapon. It's great to see in this day and age of video games and mobile phone apps, that Hasbro are still bringing traditional toys to the market. These sets are great value for money, but then this is what we've come to expect from Nerf releases.